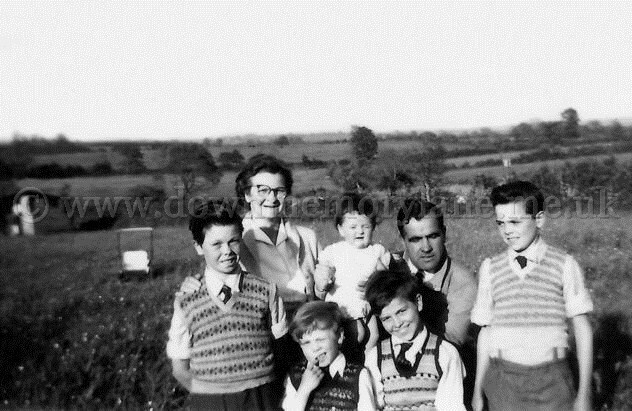 Here we are at the home of the Selfridge family in Magherabeg back in 1959. Just look at those fields, I just loved playing in the fields such great times then. At the back on the left we have good old mum Elizabeth then Molly and dad Andy. In the front are Wilbert and I remember wearing sleevless jumper like that, then David, John and Raymond. As you can see Raymond is wearing braces the ones that hold up your trousers. My mother used to buy the short trousers at least two sizes bigger to get more time out of them and the braces kept them up.